Our Art Nouveau and Baroque style nostalgia bike racks are perfect for bringing the flair of yesteryear to your front yard or your shop. Bicycle racks from Casa Padrino offer you safety from falling over and in some cases also from the theft of high-quality and expensive bicycles. In addition, a beautiful and elegant nostalgic bike rack illustrates where parking bicycles is allowed in your home or business, and where not. The high-quality nostalgic bike racks are particularly well suited for bakeries, pastry shops, cafes, hotels, restaurants, medical practices, law offices. But of course, other tradesmen can also purchase our nostalgia bicycle stands with flair and present their customers a dream eye catcher. 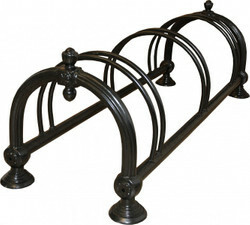 Our nostalgic bike racks are very robust and, above all, very good weather resistance! Our conclusion: High-quality bicycle stand for parking bicycles of your customers, visitors or yourself! If you have questions or special requests regarding our offers, please call us on the hotline + 49-201-36577485 and our qualified support will help you in every detail!